Concussions, also known as Traumatic Brain Injuries (TBIs) can cause symptoms such as dizziness, vertigo, headache, neck pain, sensitivity to light, irritability and insomnia that last months to years. 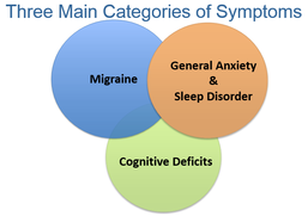 Patients with post-concussive syndrome often receive fragmented treatment for their individual symptoms and as a result fail to achieve full recovery in a short period of time. Dr. Fotuhi, who in addition to his expertise in cognitive neurology is an expert in the field of dizziness, vertigo, and migraine, has created a Concussion Recovery Program to help TBI patients get back to their work or school in a timely fashion by receiving all of their treatment under one roof. Mild Traumatic Brain Injury (mTBIs), commonly referred to as concussion, can cause dizziness, vertigo, headache, neck pain, sensitivity to light, sensitivity to noise, insomnia, irritability, memory loss, and inability to get things done. Most patients feel they are functioning at 20% to 80% of their usual baseline. Sometimes, these nagging symptoms can last for weeks, months, or even years. Patients with this condition, called post-concussive syndrome, often receive fragmented treatment for their individual symptoms from different experts, and as a result, they fail to achieve full recovery. At our brain center, you will first meet with Dr. Fotuhi. He has a great deal of experience in taking care of patients with headaches, sensitivity to light/sound, irritability, insomnia, memory loss, vertigo, and fatigue. Having taken care of more than 5,000 patients with variety of such symptoms, he knows well how to care for patients who have post-concussive syndrome. These patients often have the above symptoms for months to years and feel frustrated by their failure to return to their baseline. Dr. Fotuhi feels for them and with the help of his multi-disciplinary program gets back on their way to full recovery. After your initial visit with Dr. Fotuhi, you will be scheduled to undergo a thorough neurocognitive assessment. We establish which of your brain functions are above average for your age and which ones are below average for your age. We also use questionnaires to gauge your level of insomnia, daytime sleepiness, anxiety, depression, headache, irritability, dizziness, and sensitivity to motion, sound, and/or light. A Brain Mapping qEEG will help us measure the level of electrical activity in different corners of your brain. It uses small sensors similar to the ones used for a hear EKG to reveal if parts of your brain are running too fast or if other parts are running too slow. You may also undergo a brain MRI, blood tests, or fitness testing, depending on your particular clinical issues. Once you complete your thorough assessment, it becomes clear which parts of your brain need the most amount of training and which aspects of your life need to most amount of improvement and coaching. The treatment component of your program begins with your meeting with your brain coach. He or she will explain to you the specific component of your 12-week training with us and answer all of your questions. During your subsequent brain coaching sessions, you may receive training and instructions for meditation, memory improvement, better organizational skills, exercising more, brain healthy diet, and stress reduction. You will be assigned specific brain games that are tailored to boost your attention, concentration, processing speed, and recall. Each week, you find yourself getting better and better. At mid-program, after six weeks, you will repeat the cognitive evaluation and brain mapping qEEG. It will show you how you have improved and which areas of your brain function need further training. Your brain coach will review these results with you and help you become more confident as you impress yourself and your family members with your success stories. At the end of the program, you will most likely have formed new healthier lifestyle habits such as better exercise regimen, better diet, better sleep pattern, and better organizational skills. When have your final cognitive evaluation and qEEG to capture your progress with objective testing. Dr. Fotuhi will review these results with you and answer any questions you may have. The vast majority of our patients report remarkable improvements in their concussion symptoms and return to full time school or work activities. In a single-arm intervention trial that was performed, 22 patients with an average age of 32.68 and a diagnosis of post concussion syndrome received brain coaching and neurofeedback over a 12 week period. Upon completing the program, patients on average improved in 10 out of 15 cognitive domains. The post-program cognitive tests showed 68.2% patients had large effect size and improvements in at least 5 of the 15 areas of cognitive function. In addition, 22.7 percent of patients had improvement in two to four areas of cognitive function. The post-program cognitive tests showed that 90% of patients had significant improvement in their cognitive results. Above is an example of the cognitive evaluation results of a patient who completed our Concussion Recovery Program. Scores were taken at the beginning, middle, and end of the program. The cognitive evaluation measures a variety of cognitive domains, and this patient’s results show significant improvement in the majority of her domains over a three month period. Remarkably, her reaction time went from the 3rd percentile for her age group in March 2017, to the 87th percentile for her age group in July 2017. Patient’s brain mapping qEEG also provided objective evidence that her brain waves had improved significantly throughout the program (less abnormal “red” in the panel on the right, compared to the panel on left).